Get used to using a scratch pad. No calculators are allowed during the ASVAB, so during the math sections in particular, you’ll want to be versed in working out complex problems on paper. Take timed tests. Letting time get away from you is a sure fire way to get yourself into trouble. Timed sample tests like the ones on this site can get you used to dealing with the allowed timing for each section so you can learn to maintain a pace that will get you through each section. If you’re taking the paper version of the test, feel free to skip a question if it’s got you stumped, but be sure to come back to complete it. The computerized test doesn’t give you an option to skip questions, so have a strategy in place for questions you can’t solve relatively quickly. Read each question carefully to make sure you’re providing the answer to the correct question. Getting tripped up on the wording of some questions can cause you to consider incorrect answers. If you don’t know the answer to a question, narrow the field of correct answers where possible to narrow your options. If two answers are extremely similar, it’s unlikely that one of them is correct. Two seemingly opposite answers likely means one of those two will be correct. If all else fails, stick to a guessing strategy. As opposed to bouncing around between answers, if you have no clue then pick a letter and run with it. Varying your guesses as opposed to sticking with a single choice will decrease your odds of getting your guesses correct. asvabpracticetestonline.com may get a commission from the products below. 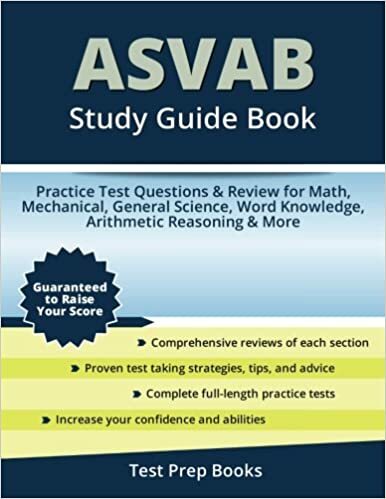 A quick Google search will show you an enormous number of options of ASVAB study guides that are free (like our free ASVAB practice test) and there are also a number of excellent options from other trusted publishers like the highly recommended ASVAB study guides below. 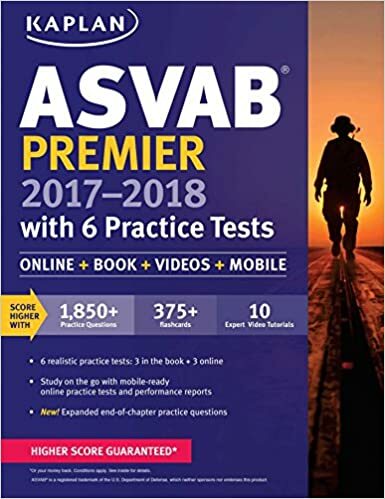 The Kaplan ASVAB Premier is a study guide offering flash cards, DVD and online practice for the ASVAB. Kaplan is one of the most trusted names in the test preparation business and one you can rely on to finely hone your skills if you’ll be taking the ASVAB and AFQT. You’d have to be a dummy to not realize practice makes perfect with the ASVAB. 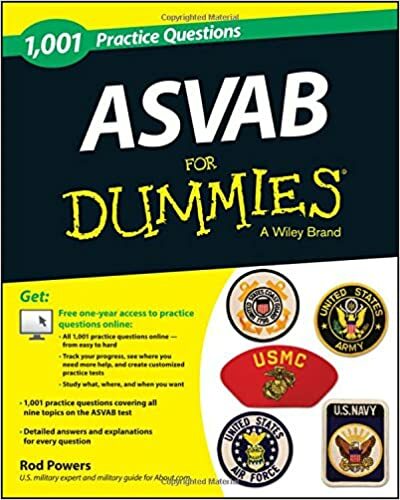 The ASVAB for Dummies book offers up 1,001 practice questions to help you prepare for the ASVAB and AFQT. 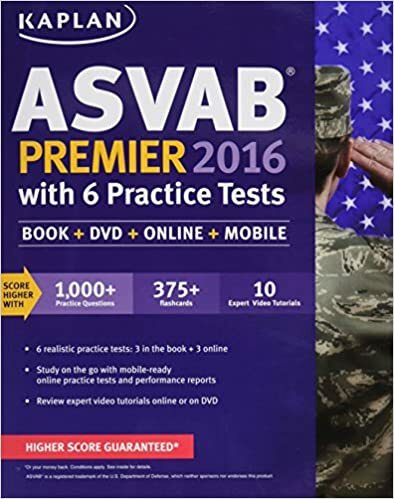 The Kaplan ASVAB Premier 2017-2018 Practice Tests are the top of the line study prep materials for potential test takers. How do you know? Try the “Higher Score Guarantee” it comes with. Not many testing materials offer up that level of confidence in their product. With over 1,850 questions, you’d be hard pressed to find something more comprehensive than this collection of online, print, video and mobile test practice goodies. A whopping 91% of the reviewers of this ASVAB study guide on Amazon gave it five stars. The other 9%? Four stars. If you can’t trust Amazon reviewers, who can you trust? The beauty of this simply titled study guide is in the depth of explanations in how the answers are derived, particularly in the mathematics sections where the authors go to great lengths to illustrate the more complex questions.